Rep. Jason Chaffetz, who is running to be speaker of the House, has some foes in Washington for going after Planned Parenthood and the Secret Service. But his constituents say they appreciate him standing up for conservative values. As chairman of the House Oversight and Government Reform Committee, Rep. Jason Chaffetz, R-Utah, has pushed investigations into the Secret Service in the wake of security lapses at the White House, and he aggressively challenged Planned Parenthood. He&apos;s now shaking up Capitol Hill even more as a challenger to Rep. Kevin McCarthy, R-Calif., the current House majority leader, in the race for speaker. Chaffetz is a relative unknown outside of Washington, but in his district, which stretches from the southern suburbs of Salt Lake City down through most of southeastern Utah, constituents see him as someone who holds fast to his conservative principles and is quick to challenge the status quo. "I think it&apos;s good that he&apos;s willing to stick his nose in stuff to make things different," said Wayne Holdsworth of Utah County, who did not vote for Chaffetz. Another constituent, Larry Winn, voted for Chaffetz and said, "If he believes in something, he&apos;ll go after it like the Secret Service thing we&apos;re talking about, Planned Parenthood. He goes after what he&apos;s passionate about and I admire that." A lot of Chaffetz&apos;s passions were formed during his time at Brigham Young University in Provo, where he played on the football team. Chaffetz was recruited by then BYU football coach LaVell Edwards in 1985 be a place kicker. As the Salt Lake Tribune reports, "the young athlete relished pulling off his helmet after a successful boot and fanning his curly locks for the cameras." When he arrived at BYU, Chaffetz was a Jewish Democrat. He even campaigned in 1988 for then-Massachusetts Governor Mike Dukakis in his presidential bid. Chaffetz has family ties to Dukakis. But by the time Chaffetz graduated from college in 1989, he had converted to the Mormon faith and the Republican Party. He credits Ronald Reagan for much of the shift in his ideology. In Utah, delegates are in charge of selecting political candidates in the state, and Republican State Sen. Howard Stephenson said he admired Chaffetz refusal to spend money on delegates when he campaigned for Utah&apos;s 3rd Congressional district in 2007. He said a lot of campaign money is spent on feeding delegates, but Chaffetz refused to buy them anything. "Not even celery sticks. He said it&apos;s not about feeding delegates. It&apos;s about meeting with them and if they&apos;re not willing to meet with me in their homes or in their local library then I just won&apos;t be able to reach them." And Chaffetz did reach the delegates. In 2008 he ousted incumbent 3rd District Republican Chris Cannon who failed to get the party&apos;s nomination in the primary. When he announced that run in 2007, he described himself as a "frustrated conservative" who was "hungry and excited." "He has core principals about limited government, individual responsibility, individual rights and freedom and he believes in those things so deeply," said Republican State Sen. Stephenson, who met Chaffetz as chief of staff for former Republican Utah Gov. Jon Huntsman. Shirley Johnson, who was an assistant to football coach Edwards at BYU, said she&apos;s not surprised at how far Chaffetz has gone in his career, but rather how fast. "He was real bright and clever and he&apos;s articulate. He was more of a loner. Most of them palled around with each other. He just had his own agendas and his own thoughts and he had confidence in himself," said Johnson. Stephenson believes Chaffetz is making a difference in Washington, holding the federal government accountable. "Rather than following the wind and just being a wind vane, he stayed his course." 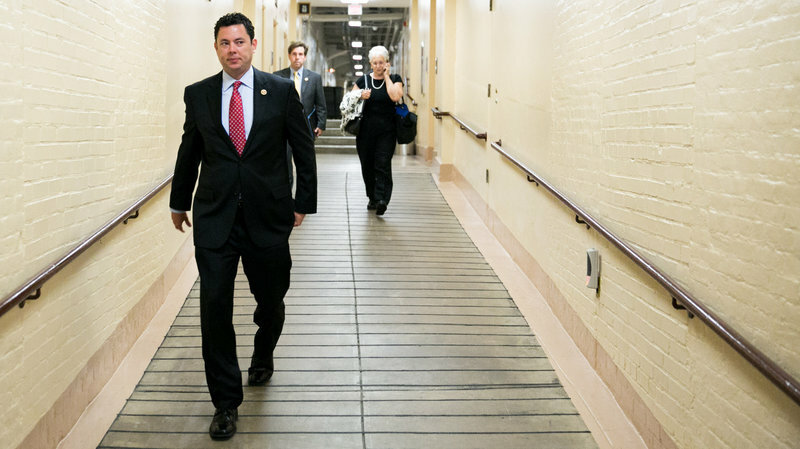 But staying the course means Chaffetz has gained some foes along the way. Chaffetz was recently criticized for going too far during a committee hearing with Planned Parenthood head Cecile Richards, repeatedly interrupting and talking over her. He was also criticized for showing a misleading chart during the hearing. The chart, which had no Y axis labeled, appears to show that the overall number of abortions performed is far higher than the number of cancer screenings when it is in fact far lower according to the organization&apos;s statistics.